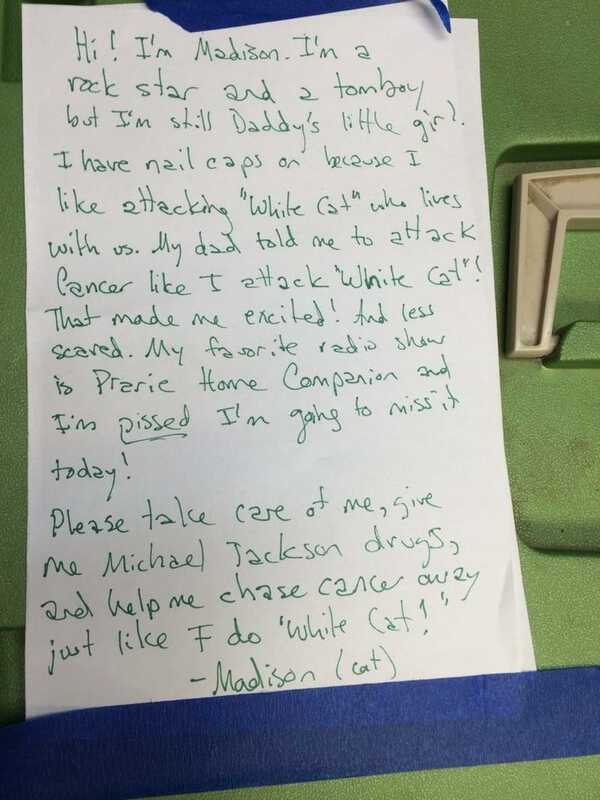 This is the note I put on Madison (aka Cancer Cat)'s kennel when she went in for surgery Saturday. She had a mastectomy on Saturday and we brought her back yesterday. Husband went back to Wisconsin last night. I'm home taking care of her and the rest of the pets. I'm kinda freaked out. They took the mammary glands, a lymph node, and some of the muscularture in her chest that the tumor had spread. This is not unseen in these surgeries but is not a sign of "HAPPY DO DAH HAPPY DO-DEE! LOOK AT THIS CAT SHE'S CANCER FREE!" happiness. She's in my dog's huge kennel now in the living room. She obviously has to be separated from the rest of the animals but I didn't want her to be ALONE. I want her to get closer to HERSELF as soon as possible and as medically safe as possible. Liquid painkillers through the mouth. Anti-inflamatory oral pill that she's taking when mixed with grain-free wet food. We'll find out about the tumor (grade and type) in 3-5 days. ... but on a cat. I don't quite know what to do with myself. I have a bunch of different ideas but some depression is kinda working it's way back. I'm watching an ep of "The Writers' Room" on Netflix and should be loving it. I've wanted to be in rooms like this a million times before and have felt decently confident in my own abilities but somehow feel really inept and spiritually castrated. FUN! I guess having a cat with cancer and getting irrationally upset at every person I see who doesn't react exactly how I want them to is probably not going to be great for my mood. I'm gonna order some Thai food and maybe lay down in the other room for a little. Love to everyone.